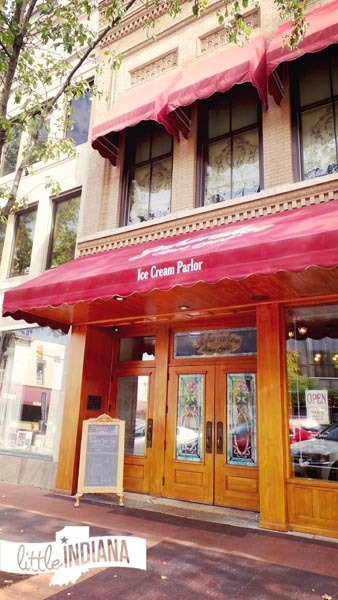 Zaharakos Ice Cream Parlor and Museum in Columbus, Indiana has been a destination for more than one hundred years. Long-time locals know it as “the Greeks” but to everyone else, it’s a great step back in time that dishes up amazing ice cream (and food). 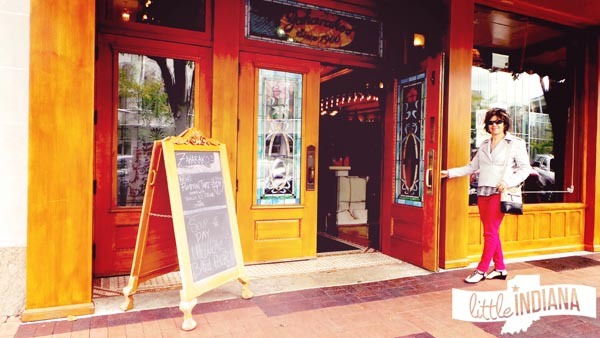 This popular downtown destination began as a candy shop run by the Zaharakos family that opened October 20, 1900. It’s often, lovingly, referred to as “The Greeks” because three brothers: James Lewis, and Pete Zaharakos, decided that they were done with the family general store and tailoring shop in Sparta, Greece. Instead, they took a different tack. They moved to Columbus and opened a candy shop. Homemade and specialty candies were available from the oak glass-front cases. The Zaharakos conveniently lived right upstairs in a large apartment. The brothers bought a forty foot long Mexican onyx soda fountain from the 1904 St. Louis World’s Fair. Business must have been going well. 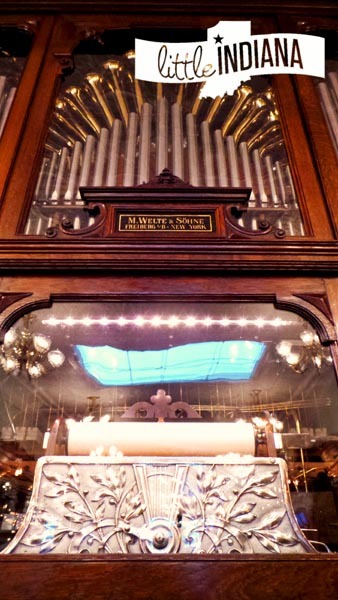 In 1908, they purchased a brand new Welte Orchestrion. Full concert and German-made, it cost $5,000. That was no small change in 1908. We’ve talked about Orchestrions here on Little Indiana in the past (enthusiasts should click here to see the working orchestrion museum at Dr. Ted’s Musical Marvels), but in case you don’t know, an orchesterion is like a player piano, but instead of a piano, it’s an organ, so there are pipes, in addition to percussion. The Welte Orchestrion uses a paper roll to play the music, which Zaharakos frequently switches out with their very large stash of paper rolls in the custom-made cabinet upstairs. They strive to play peppy, upbeat music. Just ask for a demonstration. The brothers weren’t done yet. In 1911, they bought the shining mahogany double back bar that has fifty feet of mahogany cabinets with amazing marble pillars, mirrors, and glass. It’s a standout piece. Business continues and the years pass. In 1945, brothers Gus, George, Pete, Lewie, and Manual take over the business. It’s a busy time for them. This was the place to go to be seen. Lines formed outside on Friday and Saturday nights during Zaharakos’ younger years. The popcorn machine was brought outside as well. Folks would buy a popcorn before heading to the movies. It was a time when you could get a coke for a nickel. Teens had jobs as soda jerks. This was the local hangout. In fact, J. Irwin Miller, Eero Saarinen, and Charles Eames were said to have “talked shop” over ice cream in the 1940s. Until 2006, that is, when Zaharakos shut its doors–and sold the Welte Orchestrion to a private collector in California. The town was shocked. Everyone mourned its loss. It had been a part of the community for as long as they could remember. Now, they feared it would never be heard by the public again. A group of locals got together in 2007 and decided that something had to be done. They couldn’t just sit there and let this downtown icon die. Someone needed to do something. That someone turned out to be Tony Moravec, a man with an eye for antiques. Tony didn’t want to do a patch up job. No, he decided that, if he were going to do this, it needed to be done right. The first order of business was to track down the whereabouts of the Welte Orchestrion and bring it home. It wasn’t easy, but the orchestrion was a part of Columbus history–and it needed to return. Collectors don’t generally want to part with their toys. Tony headed to California to try to strike a deal with the new owner. He did. It took a year, but Durward Center got the orchesterion performing (and looking) as good as new, its 184 pipes of wood, tin, and brass, drums, and triangle, are playing once again. It’s a story I just love: Durward Center had traveled up from Kentucky in 1967 to listen to the orchestrion at Zaharakos. That trip as a teenager inspired a career. He now restores mechanical musical instruments. It’s fitting that Center would be the one to revamp the Welte Orchestrion. The exterior of Zaharakos now retains a turn-of-the-century look. Instead of the typical 1950s theme used by so many ice cream parlors, Zaharakos is all about the 1900s, the time period when the place first opened. If I remember right, Zaharakos had an unchanged exterior until a car tore through the front door and window in the 1950s. Although the driver got in trouble for drunk driving, the real story is that the man suffered from seizures and that an eye-witness knew about it (and the law preventing folks with seizures from obtaining a driver’s license), and so lied to help protect him. To say that the closure of Zaharakos was a blow to the community was an understatement. And understandable. We like to frequent our favorite places, don’t we? You can believe me when I say that the renovations have entirely transformed the once-shabby ice cream parlor into a clean, bright, bustling place. I know because I was there, just three years before it closed. Funny to think, but I had first wandered in the doors of Zaharakos back in 2003, long before Little Indiana. Even then, I had my camera in my hand. But, I did not take any images of Zaharakos. Then, I hate to say, it was dark, dirty, and rundown. I had ordered a sundae because I saw that the hot fudge was homemade (you can find a great recipe for chocolate shell here). The guy behind the counter informed me that they were sold out. Bummer. I remember the orchestrion, although I no longer remember what I ordered instead. I seem to recall that the orchestrion was roped off. It was not the Zaharakos you will be greeted with today. Much like Cinderella before the ball, Zaharakos interior bares little resemblance to its once neglected, lackluster self. Fortunately, this kind of magic won’t fade. Onyx, marble, carved mahogany, stained glass, and brass carvings have been completely cleaned, polished, and restored to turn-of-the 20th-century brilliance. The 1905 Tiffany-style lamp has had the original spigots replaced, the feature that would have served soda water decades ago. The 1890s maple wood floor is back to beautiful after the thirteen layers were removed from it. Every piece of trim, every mirror, and every panel has been taken off, then carefully, painstakingly, restored, and placed right back into the room where it belongs. The skylights and tin ceiling have been repaired. The brass chandeliers are gleaming. After acquiring the building next door, they opened up the wall, enabling space for a larger kitchen, and a museum. It contains a rare Puffer soda fountain. Its multi-colored marble is amazing and still contains the labels that include names like “Peru N beer.” Don’t you wonder what that is all about? All the way in the back, the Whitman Room is a more private space for groups, offering its own soda fountain counter and the original front doors. I love when folks have that kind of foresight. The Grand Opening of 2009 was grand, indeed. In the first two hours, more than 500 people were served. More than 2,000 people were served that day. Long lines formed along both sides of the building for tours. 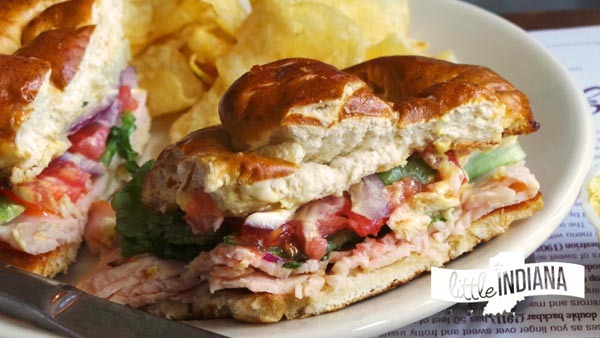 Incredibly, 75% of the day’s orders were for the Gom sandwich, serving up ninety pounds of it. Members of the Zaharakos family were present. So, too, was Durward Center, the man who spent a full year restoring the orchestrion in his Baltimore, Maryland shop. More than 3,000 people turned out for the big event, some even camping out on the sidewalk that morning, just to be first in line. The notes of the Welte Orchestrion playing beautiful, flawless sound for the first time in decades, was said to bring tears to many an eye. It was reported to be an emotional moment for many. I toured the upstairs. It is amazing. What was once the apartment of the Zaharakos family is now a private rental space that’s perfect for bridal or baby showers, and other special events. There’s a nice large room for much larger gatherings as well. The apartments, however, have been done to mimic Victorian styles, much like the ice cream parlor and museum space below. The museum space contains backup orchestrions. These were purchased in case the deal for the original Zaharakos orchestrion fell through. There’s also a restored Seeburg Style L Coin Piano. It’s also the home of items that date to the 1800s, while the main area of Zaharakos is all about the 1900s. There are two soda fountain counters here. 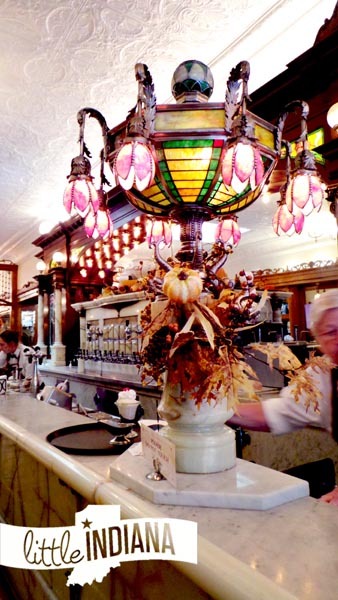 Did you know that the largest collection of pre-1900 marble soda fountains on public display (including one that dates from the 1850s) can be found here as well? That’s not even talking about the soda fountain syrup jugs mainly used between the 1910s – 1940s. These hard-to-find items can range in price from a couple thousand to tens of thousands. Zaharakos has many on display. 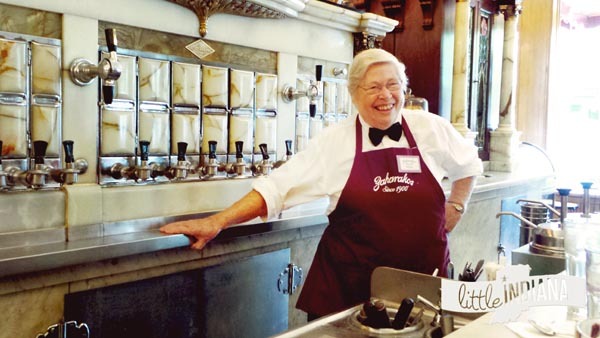 Zaharakos Ice Cream Parlor Museum in Columbus, Indiana: Wilma Hare jokes that she was a soda jerk as a teen and “still is.” Hare has been with Zaharakos since 2009. 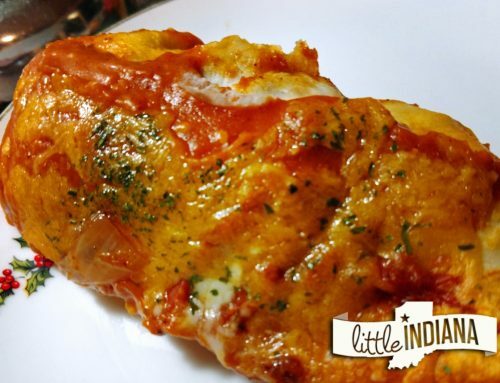 Now, you can find excellent home-cooked food. You will need to wait. This isn’t fast food. 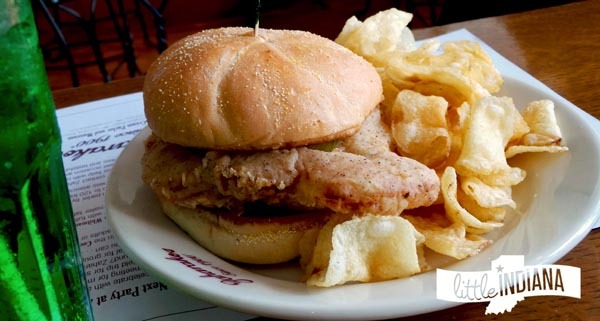 This is good food, served with a smile, by people who care. Wilma Hare, shown above, has had her image in publications around the world. Isn’t she the nicest? I thought I should make sure to include her here, too. She made the beautiful strawberry milkshake that you can see at the top of this page. Yes, it was good. Thick and satisfying. There’s more where that came from. 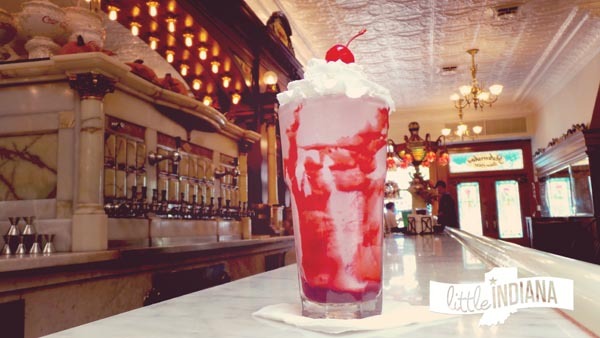 Have an old fashioned ice cream soda (cherry is the most popular flavor). Mix up flavors with syrups ranging in flavors from lemon to cherry, strawberry, red or blue raspberry, vanilla, orange, and even cinnamon. Get creative. Mix it with Coke or soda water. Don’t forget to consider the popular Green River drink, it’s a local favorite. You can see its vivid green peeking out a few images above. For dessert, there’s a lot of delicious options. 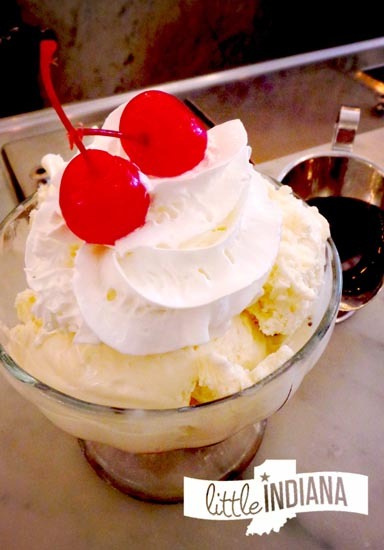 Families or a group of friends may want to consider the Big “Z,” a gut-busting sweet treat composed of five scoops of ice cream with a choice of three toppings. It’s so generously portioned, I’ve heard that families of five have no problem sharing it. My friend had the Brownie Sundae. She loved the homemade chocolate chip brownie covered in hot fudge, ice cream, and whipped cream served with a cherry on top. It is served with its own little boat of hot fudge sauce. Is that fun or what? Waffle cones are fresh-made. So, too, is the ice cream. Right before I dug into my banana split, Wilma Hare stated that it will be the best banana split that I have ever had. Now, I have had many banana splits. Many, many banana splits. I laughed it off, said that I had had a lot of them, and then…okay, Zaharakos definitely occupies space up near the top of the list for the best banana split award. They use homemade ice cream. You know that makes a difference. Tony Moravec has received plenty of recognition for the inspiring job he has spent on rehabilitating the Columbus, Indiana icon, including an award from the Historic Landmarks Foundation in 2009. It is well-earned. Follow along in the latest doings, events, and special discounts on the Zaharakos Facebook page. 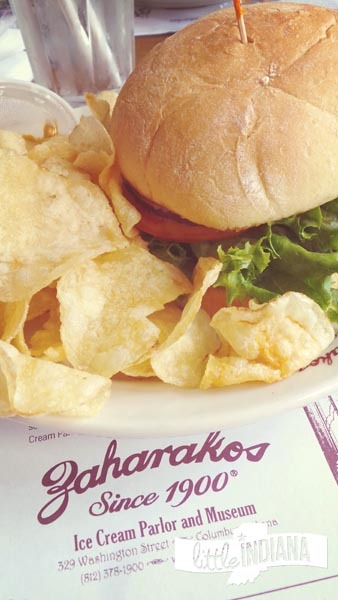 Zaharakos is typically open Monday – Sunday, 11 AM – 8 PM, HOWEVER, this is a small business so CALL AHEAD before heading out. Things happen: people get sick, power goes out, and hours change (or are even extended), so always call and verify that a business is open before making a special trip. It’s updated, it’s beautiful, and (most importantly), it’s good. 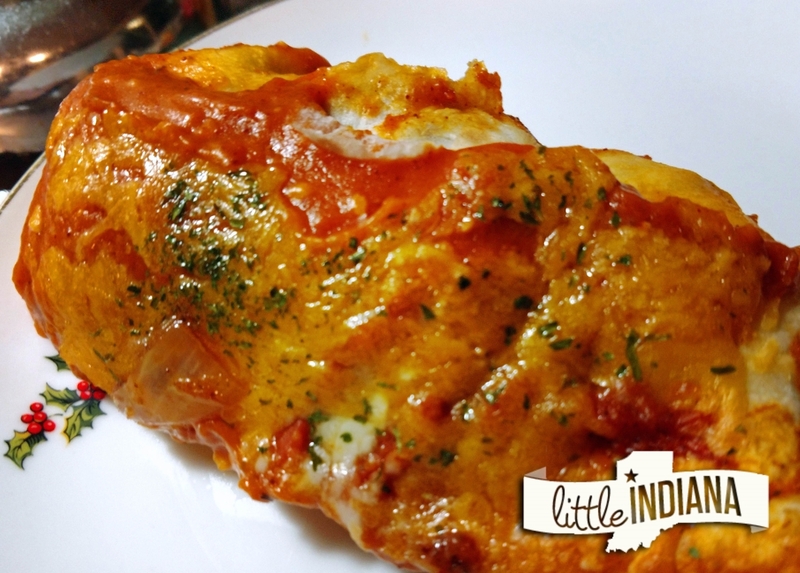 Zaharakos in downtown Columbus, Indiana is a wonderful dining destination, whether it’s for a meal or a treat, with the family or even solo. Enjoy.